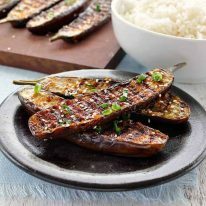 This Miso Glazed Japanese Eggplant is a great example of how simple modern Asian cooking can be. I’ve taken a traditional Japanese recipe, thickened the sauce to use it as a glaze and cooked it on the outdoor grill. It is so easy and fast, but the flavours will knock your socks off. Miso and eggplant is a gorgeous combination of flavours, and by caramelising the glaze it really takes this to another level. It always amazes me how the simplest of recipes can have such an incredible depth of flavour. This is one such dish. This recipe is based on a traditional Japanese eggplant dish called Dengaku Miso Eggplant. The traditional way of making this in Japan is to drape the eggplant in the miso sauce, which is a thinner version of the Miso Glaze in this recipe (I’ve included directions to turn the recipe into a sauce). Miso and eggplant is an awesome combination of flavours. If you haven’t tried it before, you’re in for a treat. I’ve put a summer spin on this traditional dish by making it a glaze and grilling it. This creates a melt-in-your-mouth eggplant with an incredible caramelisation that I wish I could bottle up and snack on. By cooking it on the grill you get the added benefit of the smokiness, but you can also pan fry it. 1. Cook over medium heat. Otherwise you’ll burn the eggplant before the inside is cooked. And uncooked eggplant is one of the most disappointing things in life – you know when you bite into a big hunk of eggplant, expecting it to be melting and gooey inside but instead it’s like biting into a hard sponge? Ew. 2. It caramelises quickly so don’t leave the grill once you flip the glazed side over! It will only take 30 seconds to 1 minute, depending on how hot your grill is. Greek Moussaka (Eggplant Beef Bake) – the Greek version of Italian lasagna, made with layers of eggplant instead of pasta sheets. Epic! Grilled Eggplant with Yoghurt Sauce – simple and fabulous! Miso and eggplant is a gorgeous combination of flavours. If you've never tried it before, you're in for a treat. The traditional Japanese way of making this is not grilled, it is served with the eggplant sautéed and draped with a miso sauce which is simply a thinner version of the miso glaze (see notes for directions). By grilling this, you get an incredible caramelisation which I find irresistible, while the inside is melt-in-your-mouth. This dish can be cooked on the barbecue or on stove top, though I really encourage you to try it on the grill if you can because the smokey flavours really make this something special. Preheat grill to medium (grill side, not hot plate) or a heavy based pan over medium heat. It's important only to use medium heat because otherwise the eggplant will burn before it cooks through. Combine the Miso Glaze ingredients and whisk to combine and remove lumps. Brush the cut side of each eggplant with the oil. Do it 2 to 3 times to use up all the oil. Place the cut side down on the grill and cook for 4 minutes until it turns a light golden brown. Turn over, and cook for 3 to 4 minutes. 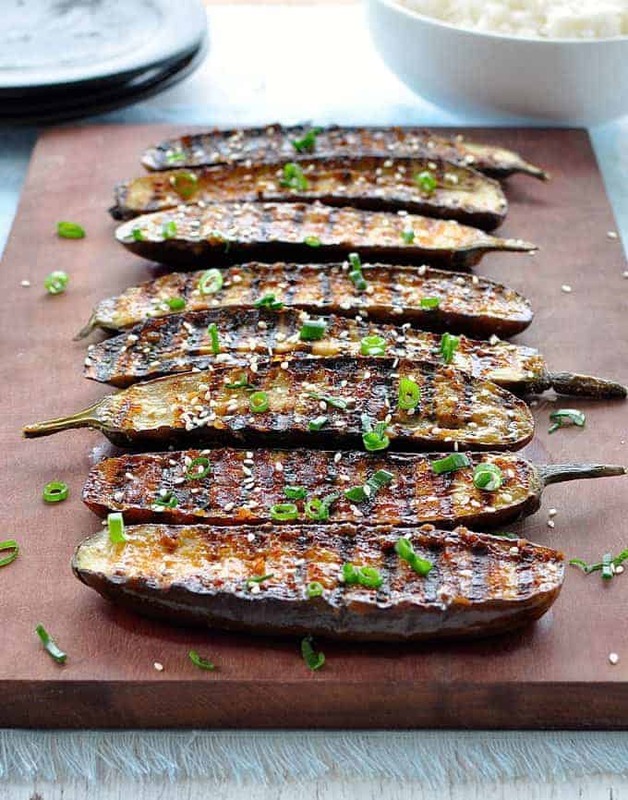 While it is cooking, use a spoon to spread a generous amount of Miso Glaze on the cut side of each eggplant. Squeeze the side of the eggplant with your tongs (or fingers if you can handle the heat!) to check for doneness - it should be squishy and soft. Turn over and grill just for 30 seconds to 1 minute, just to caramelise the glaze. Remove from grill, garnish with shallots and sesame seeds and serve immediately. 1. 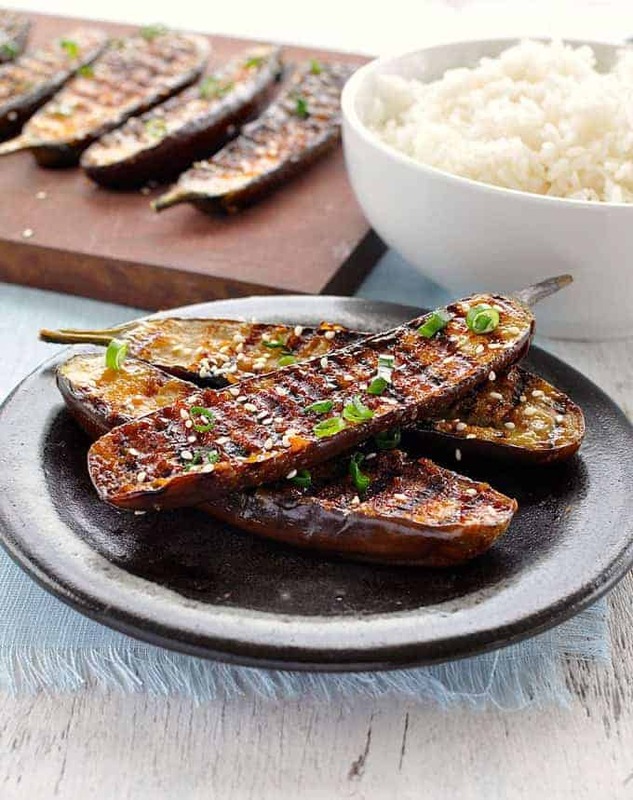 It's best to use Japanese (lebanese) eggplants for this recipe. They are thinner than normal eggplants so when they are cut vertically they will cook through. This recipe can also be made with normal eggplant but it won't look the same. Just cut into rounds about 2 cm / 1 inch thick, brush the oil on both sides (you will need an extra 1 tbsp of oil) then follow the directions of the recipe. 2. Shiro is a type of miso which nowadays is available in major supermarkets in Australia. It is lighter in colour and slightly sweeter than normal miso which is used for miso soup. You can substitute with normal miso but you will need to add an extra 1 tsp of sugar. 3. You can substitute the sake with Chinese cooking wine or sherry. If you don't have any of these, you can substitute with water and I promise it is still really tasty! 4. In Japan, this is traditionally served with the eggplant sautéed and the Miso Glaze as a sauce. You can create this simply by adding 1 tbsp of water to the sauce and steaming the eggplant, then just pour the sauce over the eggplant (without caramelising it). If we use the larger eggplants, do we need to salt them to remove bitterness? This looks really good! I love eggplant when it’s grilled or roasted, plus I’m a huge lover of miso, so I’ll definitely give this a try at home 🙂 Love that it’s so easy too, heh. Thanks for sharing your recipe! Oooh! I LOVE this recipe, made it last week for a BBQ! We are eating this thin and long eggplants all summer. And this should be a recipe on list since it is so easy and yummy. Simple recipe with great flavor. Agreed! I am lucky, we get these eggplants in Australia all year round. I love them! Eggplant is kind of touch and go with me, it depends on the method of it being cooked. That being said, this looks like something I would like! Need to try this one day!